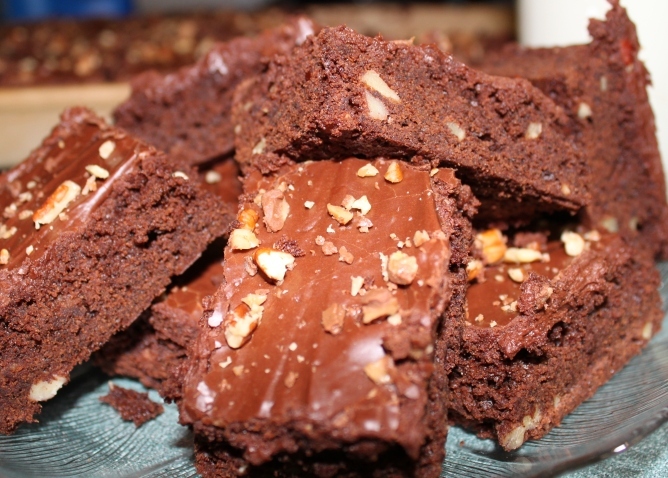 Fudgy Chocolate Heath-bar Brownies | Rosetta Bakes! 1. Preheat oven to 350 F. In a medium saucepan melt butter and unsweetened chocolate squares over low heat, stirring constantly. Remove from heat and allow to cool. 2. Grease an 8 x 8 x 2-inch baking pan; set aside. Stir sugar into cooled chocolate mixture in saucepan. Add the eggs, one at a time, beating with a wooden spoon just until combined. Stir in vanilla. 3. In a small bowl stir together the flour and baking soda. Add flour mixture to chocolate mixture; stir just until combined. If desired, stir in nuts. Spread the batter into prepared pan. 4. Bake for 30 minutes for 8-inch pan or 25 minutes for 9-inch pan. Cool in pan on a wire rack. If desired, frost with chocolate icing. Fudge Icing (also great for cakes)! Mix Cocoa and sugar. Cream part of cocoa mixture with butter. Blend in vanilla and 1/2 of milk. Add remaining Cocoa and sugar mixture and blend well. Add remaining milk and beat to desired consistency. Additional milk may be added if desired. While brownies are still warm, spread 1/2 of icing on top brownies, let cool then spread other half of icing. Sprinkle chopped nuts (your choice), and heath bar crunch on top of icing. Let cool completely then cut in squared. *hint: to get straight edges when cutting brownies, run knife under hot water and wipe clean, then cut again. Keep doing this until all brownies are cut.